As part of our work for Constructionarium Ltd to look at how the Constructionarium experience could be brought to more audiences, we developed three approaches for how Constructionarium-like activities could be created for school-aged users. The first approach was create smaller version of the existing Constructionarium projects, needing less skill and time to complete. The second approach was to create an eco-house project in which children would have the chance to build different walls from different materials. The third approach was to use our Big Rig event format to create a scenario in which children could build a deconstructed house. 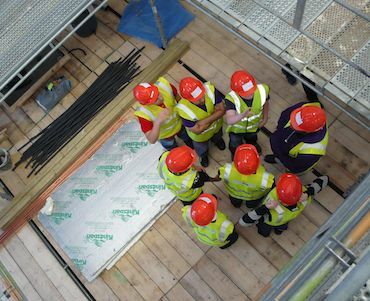 While none of these approaches have been adopted by Constructionarium yet, the latter two formed the basis of a series of hands-on activities that we have been developing for construction-themed university technical colleges.